"Agricultural Risk Transfer is an outstanding source of technical information combined with real-world experience by a seasoned industry expert and should be in the bookshelf of every professional in the agricultural (re)insurance industry. References to numerous industry case studies and links to opensource data nicely facilitate the understanding of the key concepts." "This volume is an important addition to the growing literature on agricultural risk management. It comprehensively synthesizes a host of relevant issues related to both mature and emerging agricultural markets. Agricultural Risk Transfer is a great resource for researchers and students seeking to gain deeper insight into how insurance and other financial instruments can stimulate investment in agriculture by transferring catastrophic risks out of local areas and into global markets." "Risk transfer is a crucial element of disaster risk finance and an important instrument for the sustainable rural development and financial inclusion. This book summarizes all key concepts of it and comes right in time as the implementation of more agricultural (re)insurance and capital market risk transfer solutions is needed more than ever in the wake of the increasing adverse impact of climate change." "Through its holistic approach and case studies, Agricultural Risk Transfer forms the ideal basis for regulators and government agencies to approach and integrate agricultural risk transfer into national risk management frameworks." 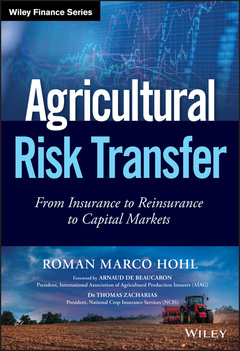 "Insurance-linked securities offer interesting opportunities for the agricultural sector – this book comprehensively analyses and illustrates how cat bonds, industry loss warranties and other capital market instruments can be applied to agricultural risks." "A very large portion of people living in extreme poverty have their livelihoods tied to some form of farming and 93% of those living in extreme poverty are in countries that are politically fragile and/or environmentally vulnerable and ill-equipped to help their people when there is a natural disaster. Making matters worse, 94% of the economic losses from natural disasters over 1990–2016 in low- and middle-income countries were uninsured. This 'protection gap' is particularly acute for agricultural insurance. This book provides a comprehensive and thoughtful analysis for the challenges in risk transfer for agriculture and promises to contribute to efforts in closing the protection gap. The chapter on data is outstanding and very useful as we also identified data as a major constraint in providing risk transfer in low- and middle-income countries." DR. ROMAN MARCO HOHL is one of the best-known agricultural reinsurance underwriters in the industry. He has worked on most primary aspects of agricultural risk transfer, including work for reinsurance companies such as Partner Re, Converium and Swiss Re. With these companies, he built agricultural underwriting teams and developed new insurance schemes. He also led the development of agricultural risk models for India and China at the Asia Risk Centre, a leading agricultural risk modelling company which is now part of Risk Management Solutions. Having worked in Singapore for 6 years and been at the forefront of the development of agricultural insurance in China, India and Southeast Asia Dr. Hohl has a deep understanding of the challenges of emerging markets. He has held various advisory appointments, including with the World Economic Forum (food security in Southeast Asia) and the Monetary Authority of Singapore (catastrophe risk assessment). He has also served as adjunct professor and deputy director at the Institute of Catastrophe Risk Management (ICRM) of the Nanyang Technological University in Singapore. He currently supports the industry through advisory mandates including work for the International Finance Corporation (World Bank Group) in developing index- based risk transfer solutions. Dr. Hohl also collaborates with the University of Wisconsin-Madison (USA) and the National University of Singapore on modelling agricultural risks, food security and risk transfer. Roman holds a PhD in Geoscience (Atmosphere) from the University of Fribourg (Switzerland). Research from his PhD thesis was used to develop the first probabilistic hail model for the European insurance industry. He has contributed numerous articles to research journals and the risk transfer media, including television interviews.